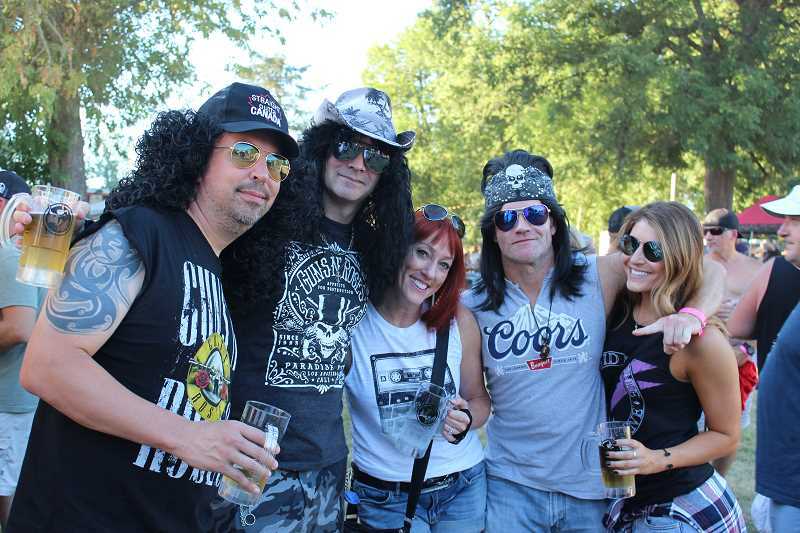 Hot temperatures didn't stop tribute band lovers from coming out in droves for Harefest 8 and Sunday's family-friendly Harefest for All last weekend in Canby. Fellow Harefester Linda Crager added, "If you don't look at them, you know, it sounds just like whoever it is. So last year, I was sending videos to my son of Guns N' Roses." The two, along with Kim Churchwell's husband Bob Churchwell, sat their chairs down on the lawn of Pat's Acres among hundreds or more others. The festival featured the main stage, front and center of course, with the "big wheel in the sky" (Ferris wheel) and a large VIP area nearby. Bars, the Big Hare Station, a photo stage, information booth and more lined the sides of the lawn. At the back was a second VIP area, called Seagram's 7 Paradise City, along with the food area featuring grub from The Pizza Cart, Baked and Loaded Potatoes, Big Fat Weiners, Olé Bowlé and more. 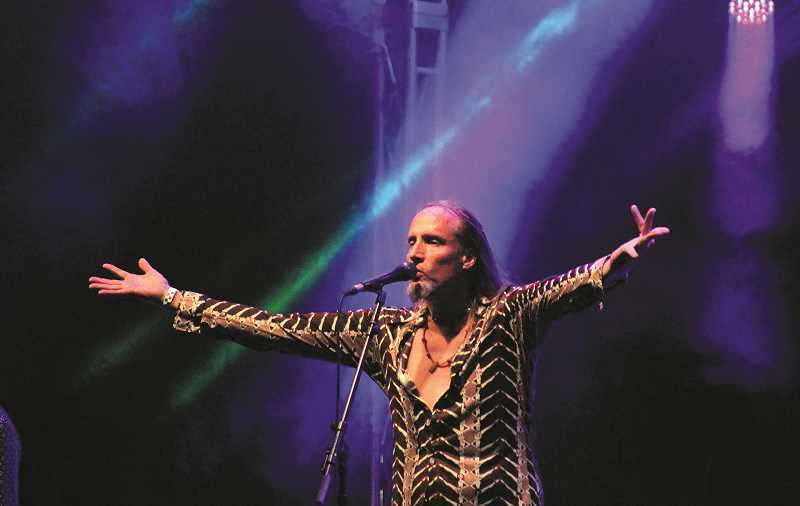 "It's outdoors, and everybody gets to come out here and enjoy a really nice evening and listen to great music," Kim Churchwell said. "It gives you a chance to kind of let your hair down and just enjoy yourself." Or perhaps, put your hair up—way up. 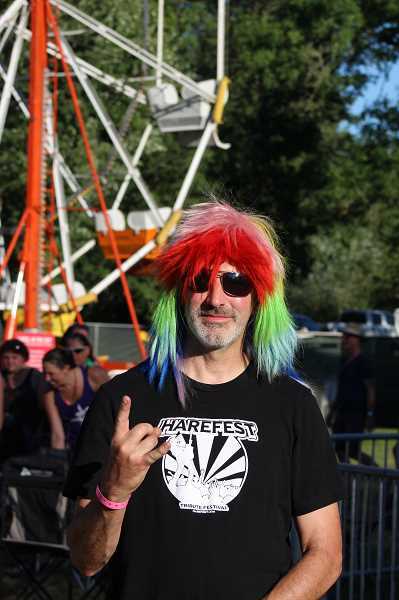 Kim Churchwell and Crager attended Harefest together in a previous year, and found themselves wearing devil's horns atop larger than life hair, courtesy of the Big Hare Station, and standing at the front of the stage for AC/DC tribute band Shoot To Thrill. "Everybody kept telling us how cool our hair was," Churchwell said. "[My husband] picked us up at the end of the night, and he's like, 'What the heck happened?' Our whole heads were like standing up straight." Whatever Bob Churchwell's reaction to the ladies' Harefest transformation, it worked. He came along this year. "This is great. What a perfect night to get away," Bob Churchwell said. "Great way to spend a Thursday night." …And Friday, and Saturday and possibly even Sunday night for those who camped out. After Harefesters went home, the Harefest team kept festivities rolling with the first year of Countryfest on July 20-21 at Pat's Acres, featuring Texas, Red Dirt and Outlaw country acts.